Ananda S. Pilimatalavuva lives a quiet life in the same town where his distant ancestors were once known as ‘King Makers’. Under the Naayakkar (Vaduga) Kings of Kandy, four Pilimatalavuvas were appointed Maha Adikarams. The third held sway for two decades, and served as a Chief Adigar or Chief Minister to two kings. The story ends in tragedy and accusations of treachery, a tale Mr. Pilimatalavuva himself explores in some length over the course of his first two books. Today, however, we are here to speak of other matters – of obscure recipes, unusual ingredients and secrets preserved in ola manuscripts. ‘Recipes from the Cookery Book of the Last Kandyan Dynasty’ brings to light a forgotten culinary heritage, one which emphasised not only the flavours of food but its health benefits as well. Though it is estimated to be nearly two centuries old, the writing on the ola leaf is still clearly decipherable. As you would expect, the language is archaic, the things it refers to not necessarily commonly available. 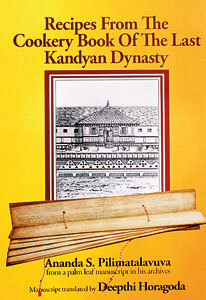 Though five other copies exist, this is one of two left in a private archive, says Mr. Pilimatalavuva explaining that the descendents of the royal chefs living at Dorakumbure Walawwa in Matale have another, while others can be found in university and temple archives and museums both here and abroad. Others that may have existed were most likely lost along with the family and temple collections put to fire by the British as they fought to suppress the rebellion of 1817. The manuscript has been in possession of Mr. Pilimatalavuva’s family for generations – and some found it easier to decipher than you’d expect. 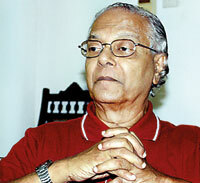 The author’s paternal grandfather Loku Banda Pilimatalavuva (Snr. ), for instance, was said to make an excellent curried lime fruit. Based on a recipe from the book, the dish is no longer served at local tables. “Though some of the dishes may be familiar to the modern cook, they are not cooked in the same way that appears here,” says the author, adding that it’s likely the recipes here only hint at the variety available in the royal kitchens. Nevertheless, there’s enough to cook a multi-course meal, providing from start to finish fare that is fit for a king. Gruel, vegetables, fish, meat, rice, dessert and even beverage recipes are included. The Pilimatalavuvas once had in their custody a number of such ola manuscripts – from notes left by the Maha Adikaram to treatises on Kandyan dancing. Unfortunately, many have been lost. Still, this one was likely to have been commissioned by the Maha Adikaran himself – “he probably got it copied from the royal kitchen,” says Mr. Pilimatalavuva. He explains that such books were probably rare in a time where people relied on memory and experience – passing on prized recipes through word of mouth alone. The recipes reveal multiple influences. The author speculates that both North and South Indian flavours can be detected. Recipes initially carried into exile by the princes of the crumbling Vijayanagagra Empire found their way to the Island through the Dravidian kingdoms of the South and into the kitchens of the Naayakkar kings. The use of jaggery, pulses and coconut, alongside digestive spices such as green ginger and pepper were first associated with the Dravidian culinary tradition, adds Mr. Pilimatalavuva. Other ingredients sound distinctly Sri Lankan – woodapple seeds, kaneyya honey, stamens of the naa flower, nelli fruit, bark from the kumbuk tree, and even the water lily known as manel appear on these pages. Though jak fruit was as popular as it is today, in a combination unlikely to appear on modern menus, it was often cooked into dishes with meat for the royal banquet tables. Its leaves were turned into a ‘kos mallun’ salad. In supplying translations of these recipes, Mr. Pilimatalavuva has gone one step further and included the scientific names of most of the ingredients. Seerassa, for instance, is identified as the adamant creeper, vitis (cissus) quadrangularis, while koora, we are told, goes by the title of amaranthus viridis. The collection is set apart from modern cookery books in other ways as well. The original ola leaf manuscript contains 332 stanzas of which 67 are devoted to other related subjects. Beginning with a salutation to the Triple Gem, the stanzas go on to tackle topics as diverse as the physical attributes a royal chef must possess, how the hearth should be prepared, good omens that should be noted while rice is being prepared and even the signs of food poisoning and the tell-tale behaviours that will give away the identity of the poisoner. As for the recipes themselves, the directions are brief, composed for most part of lists of ingredients with few references to quantities. Toward the end of the book, the reader will find several pages dedicated to natural remedies for various elements and a listing of taboo foods. It is from this section that we learn that lotus yams were said to cure hiccups and that while goat’s milk increases appetite, buffalo’s milk induces sleep. Other ingredients tackle more serious problems – the red Ashoka tree (saraca indica) can help treat cancer, heart ailments and boils and can also destroy goitres. “The spices and herbs they used had medicinal values…in their cooking these little ingredients were added so that they had a long term beneficial effect on your system,” explains Mr. Pilimatalavuva. It is in the list of taboo food combinations that one really notices how different our dining habits have become – we do not need to be told, for instance, that ‘toddy and stork flesh should not be partaken together’ or that ‘it is bad to eat dove flesh fried in mustard oil.’ It is perhaps for this reason that many of the words used in the original ola leaves proved difficult to translate. Here, Mr. Pilimatalavuva credits a number of people for contributing to the translation. Deepthi Horagoda is foremost among them, while several others who were also involved are credited in the preface. Ironically, it was modern technology that made this possible, says Mr. Pilimatalavuva, explaining that had it not been for the internet, it would have taken him much longer to put together this network. Rasa Ulu Kanda: Mix some roasted green gram without the chaff with meat cut into the size of green gram (minced meat). Then add a little water, along with a sufficient amount of cow’s milk and cook. Grind pepper, ginger, coriander, cumin and garlic separately and add to the meat. Heat fragrant oil, aromatic spices and herbs tempered or mixed with cooking oil. and add some fish as well as the green gram and meat and stir, taking care that it doesn’t stick to the fish. Wash al sahal (a kind of pale-coloured rice) and put into a pot of water with cumin and ginger and stir. When the liquid begins to simmer, add orange juice and stir. Temper cumin powder and ginger and add to the rice gruel together with the tempered mixture of green gram, minced meat and fish. Tags: Ananda S. Pilimatalavuva, Kandy, Kegalle, Maha Adikaram, Pilimatalavuva, Recipe, Recipes from the Cookery Book of the Last Kandyan Dynasty. Bookmark the permalink.